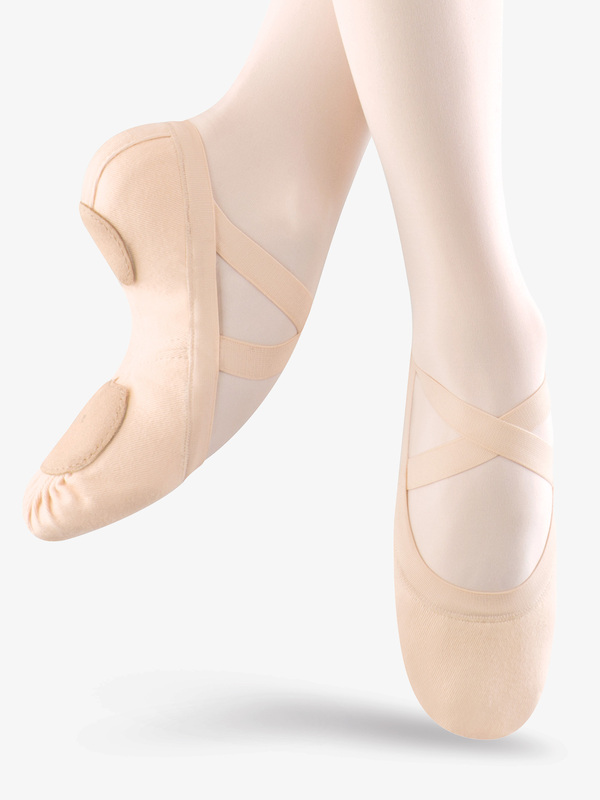 Dancers who love Bloch's Zenith ballet shoe will love the Synchrony split sole ballet shoe! Features include an ultimate stretch canvas, a wider toe, wider outsole shape, wide elastic around the top line and crossed elastic at the instep. Suggested Fitting: Please order 2.5-3.0 sizes smaller than street size. I totally agree with Yulia from Russia's review. I wish I had read her review before buying this shoe. I mistakenly ordered this slipper instead of the "Pro-Elastic Canvas Split Sole" S0621L. Do NOT make the same mistake. This shoe is cut very low for the streamlined look so if you have a high instep and higher foot profile do NOT buy!! The sides are low cut and the heel keeps slipping off and the whole slipper twists off, just like Yulia describes. I thought I was crazy. My daughter wears a size 4.5C in the Pro-Elastic but these were a lot smaller. I would definitely size up if basing the size off a previous pair of Bloch. I absolutely love this shoe. It's so comfortable and looks great on many different kinds of feet (though is ideal for people with more square toes.) No extra bulk or material, but it stretches to fit the foot. The only issue is that since the profile is so low, it sometimes feels like the heel is going to fall off. It never does fall off, but it takes some getting used to. Otherwise, I am so happy that after years of searching, I found the perfect shoe for daily classes! I almost gave up hope that I would find my perfect pair. This shoe stays in place when I pointe my foot (doesn't get baggy) and flatters the little arch that I have. The stretchy canvas is super comfortable. I also love that the soles don't interfere too much like Sansha where there's a ball of leather and canvas on the balls of your feet. I have flat/narrow feet and am street size 6 and got these in 5B and they fit wonderfully. If you hate sewing slippers and have low arches, I recommend that you try these shoes. These shoes are very comfortable and form fitting to my feet. I bought these as an upgrade from the Bloch Pro Elastic ballet slippers because they were kind of constricting. So much so that my toes would go numb during class, even though I wore the correct size. These are basically a new and improved version of said shoes. I have wide feet so I ordered a 7.5 C. I am an 8.5 street shoe with rather square tapered feet. If you're like me, you'll probably like these shoes. I would recommend this shoe only for those with lower arches, insteps, and lower profiles of the foot. The stretch factor of the shoes is nice, and very non-restrictive, thus making the feet feel "free". I have a higher instep and higher foot profile, and these shoes which are cut low to streamline the look of the foot (aka make so called "bad feet" look good) and the sides are much to low for me, and the heel keeps slipping off. If you are a person who struggles to find a flat canvas slipper that improves the look of their foot, then this might be something to try, but if you need support and high sides from a flat slipper, then please avoid these shoes at all cost. I officially had my "worst class ever" yesterday because during every single combination, i had to pause and put these shoes onto my feel. Another "pet peeve" of mine for these shoes are their eccentric orangy-pink color. These shoes are overall some of the best ballet shoes I've ever had. They form to the foot nicely and are still breathable. My daughter needed a lot of shoes for a very intensive ballet program. We were already Bloch fans but these slippers are really great. My daughter loves the fit - the canvas is really stretchy and contours her foot. We will definitely be buying more of these. I currently have the Bloch Pro Elastic Canvas in size 3.5C. Any suggestion on size for this shoes. The sizing suggestion for this item is to order 2.5-3.0 sizes smaller than street shoe size. We do not encourage you to cross compare your sizing to other brands. We advise you to follow the suggested sizing. However, if you have further questions, please feel free to call customer service for more detailed assistance. Does this have the same size/shape front sole patch as the Pro-Elastic? The soles on these two shoes will be the same. Does this have the same sole as the Pro-Elastic? What are the differences between this shoe and the Pro-Elastic? The Synchrony has STRETCH CANVAS whereas the Pro-Elastic has regular canvas. There is also an elastic piece connecting the heel and ball of the sole.